Monday was a rest day and after Sunday night, I kind of needed it. I found an all you can eat breakfast buffet in town and spent two hours helping myself to first, second and third breakfasts. When the waiter told me not to hold back, I don’t think he realized how many calories I needed. After filling my hollow leg I went to the post office and mailed a few items home. The total weight was only five pounds, but mentally I felt better not having to lug the stuff along for the remainder of the trip. The rest of the afternoon was spent catching up on email, this blog and backing up my photos. 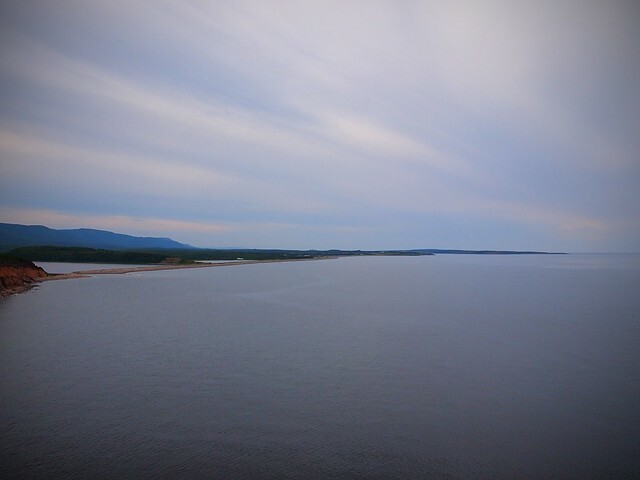 I rolled out of town around 3:30 and headed to the entrance of Cape Breton National Park. I wasn’t sure what to expect of this park. 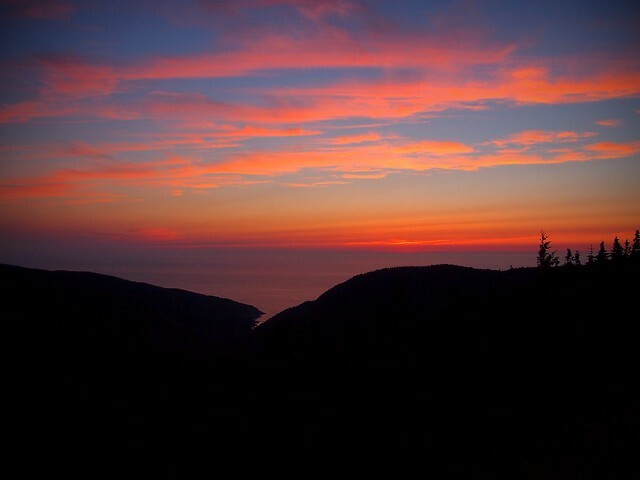 I’ve been to many of the National Parks in the lower 48 states, so I have pretty high expectations and I must say, Cape Breton did not disappoint. From the moment you roll in (I entered from the western side) the views are breathtaking. Everyone talks about the hills and yes, they are there, but no worse than you would find riding around Vermont. The main climb for the day, up French Mountain, was long, but the grade was pretty lax. 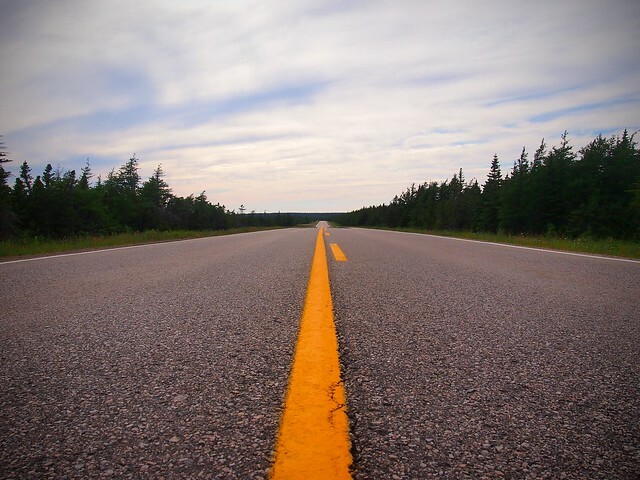 Still, for a world renown cycling destination, there is no paved shoulder on the road and many inexperienced cyclists ride two abreast swerving like toddlers without training wheels. Many honking horns were heard. With my late start I planned to ride to the town of Pleasant Bay, but once I reached the plateau high above the ocean, my plans changed a bit. The temperature was about 15 degrees F. cooler and the views beckoned me so slow down and enjoy the ride. This combined with an emergency shelter / cabin along the roadside sealed my decision on where to camp. So there I sat, typing this out and enjoying the sunset and the beautiful ocean view. I awoke the next day to cooler temperature and another clear sky. 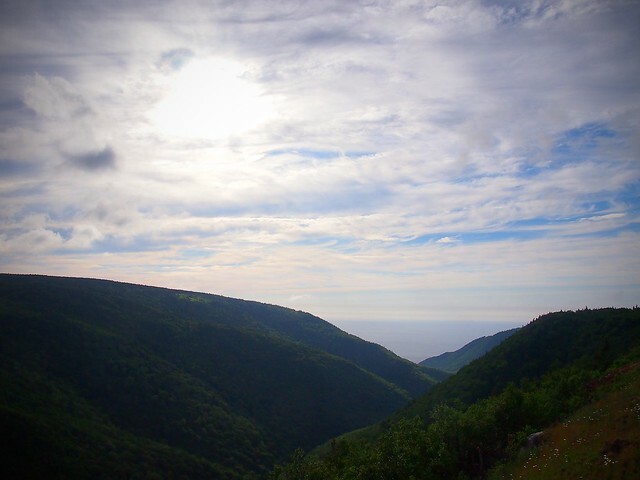 I planned on riding the remainder of the Cabot Trail, so I got an early start so there would be time to enjoy the views. The early morning start also allowed me some traffic free time on the road and I saw two moose within my first fifteen minutes of riding. I have a healthy respect for these horses of the woods and when I see one stopping to take a photo is not what I want to do. and up the next climb, a pattern that repeated itself throughout the day. After hours of climbing and descending, photo taking and eating, I finally reached the east side of the park and the Atlantic Ocean. 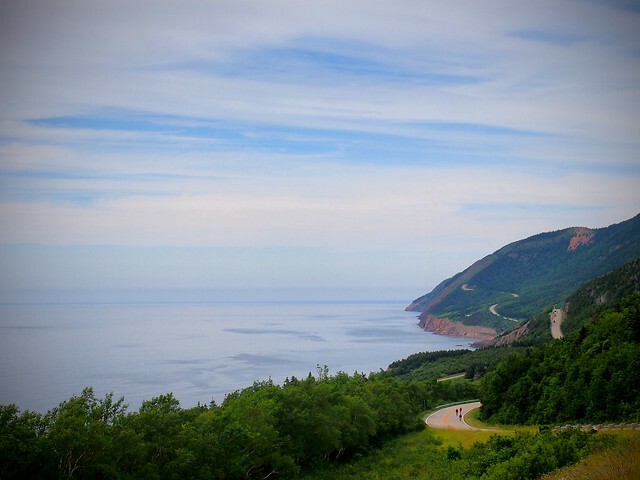 As I’ve mentioned a few times, the cycling is great, but when they constructed the Cabot Trail cycling is not something they considered, but they do give cyclists there own lane, for about 2 miles, at the east entrance of the park. The wind was at my back, so I decided to push on and take the short ferry crossing to Englishtown. I was told about a dirt road on the east side of the crossing that had some great camping spots . It had been a high mileage day so far and I was pretty tired, but my legs felt fine and this would leave me with only 30 kilometers or so to ride the next day to reach the Newfoundland ferry. There was also a ski area marked on my map, but it was located right on the ocean, so I figured it must be a mistake. It turns out it wasn’t. This must be one of the lowest elevation ski areas in Canada and it was also the start of the last big climb of the day. With the miles I had ridden so far for the day, I’ll admit it, this climb hurt a bit. Fortunately this was it for the big climbs and rolling hills took me to the short, and free, ferry crossing. It was around 8:30 by the time I reached my camping spot for the night and at one time I’m sure the camping was great, but it seems some recent flooding had wrecked a little havoc. No matter, I was plenty tired and there was a bridge that was still standing that was perfect to pitch my tent on. The next morning I rode past the Englishtown Fire Department and judging by the tall grass outside the bay doors, they haven’t seen any action in a while. There was a dirt road called Kelly Lane on my map that I had planned on taking it over Kelly Mountain, but with the conditions I found at my camping spot the previous night, I wanted to make sure it was still passable. There was an older woman doing some morning yard work and I stopped to ask about the road condition. She reported that it was really washed out and to make matters worse, she said the biting flys were the worse she’s seen in years. Judging by the cloud of flys swarming around her head, and the fact that she seemed oblivious to their presence, I took her word for it and decided to continue on the paved road. With fresh legs and a full stomach, the climb wasn’t so bad and the long decent lead me to a beautiful ocean cove where jellyfish were swimming around feeding on…… whatever jellyfish eat. and with plenty of time to take the 7:00pm ferry to Newfoundland. The remainder of the afternoon was spent stocking up on food, hanging out with two Hobos, who by the way made about 35 dollars in unsolicited handouts during the two hours I spent with them, and taking advantage of the free shower at the ferry terminal, the first so far for this trip. The call to board came around 5:30pm and after being reprimanded for not wearing my helmet, I rode my bike on to the floating city. 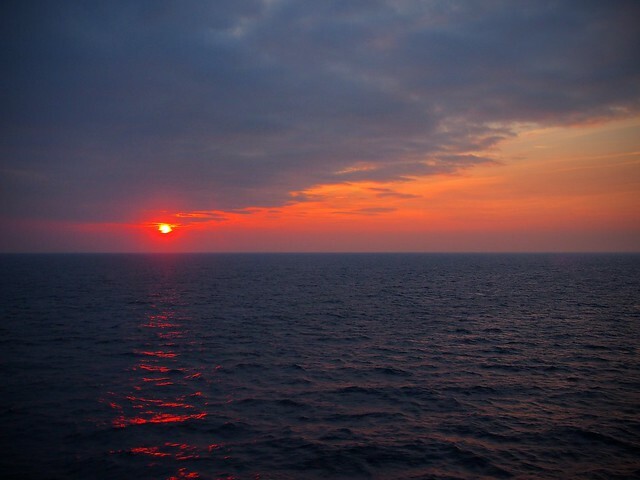 The crossing is around six hours, so it put me arriving in Newfoundland at around 1:00am with the time change, but also allowed me to catch the sunset on the Atlantic. The Hobos I had met told me the visitors center in Port-aux Basques had a huge overhang in the back if the building that would be perfect for camping, so that is where I stayed last night and fortunately so, because we had some rain during the night. Right now I’m typing this from the local Tim Horton’s, the Dunkin Donuts of Canada, waiting for the weather to clear and later today I’ll be heading north on the T’Railway, locally known as “the old rail bed”. Hopefully the sunny sky will return. It’s so great to be reading about your adventures. Keep it up! I must say I’ve felt a peristant longing to be out there traveling by bike since we got back. Such a great way to be out in the world.